If you've ever wondered what to do with the leftover bones from your Thanksgiving turkey dinner, here's what you do: make homemade turkey stock. It might sound complicated or too difficult but trust me, it's not. It's basically a matter of throwing a few things in a large pot, simmering it for a number of hours and then straining it. Easy! The difference between homemade and store bought stock is pretty unbelievable. The only warning I have for you is: once you try homemade stock you will have a difficult time going back to the stuff in cans and tetra packs. Turkey stock keeps for at least 6 months in your freezer and you can use it in any recipe that calls for chicken stock so you'll have lots of opportunity to use it. I like to freeze it in 1/2 cup and 6 cup portions in ziplock freezer bags. That way I can pull out a small bag when I need a little of it or a big bag if I'm making some soup. If you make (Name of Recipe) make sure to snap a pic and tag @theendlessmeal on Instagram so I can like and comment on your photos. I love seeing TEM recipes you create. This easy and fool-proof turkey stock recipe will turn your leftover Christmas or Thanksgiving turkey bones into an incredibly delicious soup base. Put all ingredients in a large pot and cover with water till the bones are 2-3 inches under water. Bring to a simmer then reduce heat so that it stays at a very gently simmer. You don’t want it to boil as it will make the stock look dirty. It won’t effect the taste but it won’t look as nice and clear. Continue to simmer gently, uncovered, for about 4 hours. Remove from heat and strain though a colander into a large bowl. Place a fine mesh sieve over another bowl and strain once more to remove any small particles. Season to taste with sea salt. 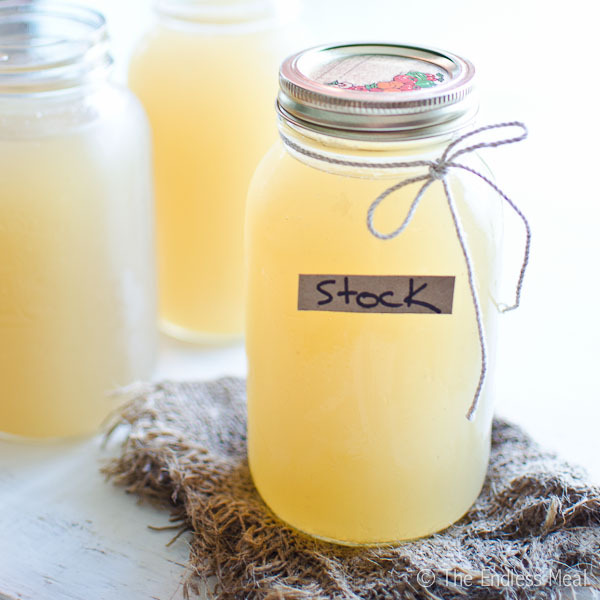 *DO NOT freeze stock in glass mason jars. The stock will expand as it freezes and break the jars. Plastic freezer bags work great for freezing stock. 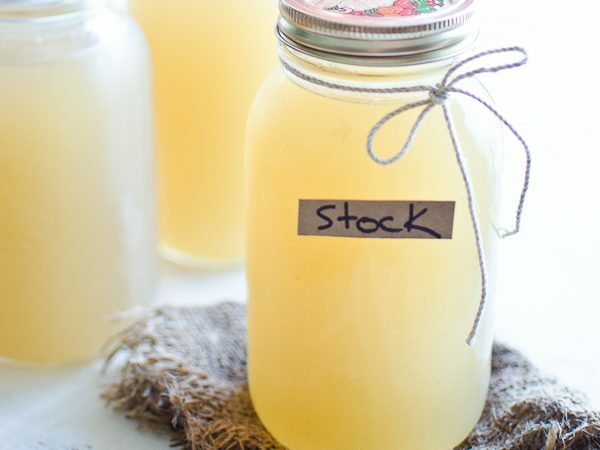 To remove fat from the stock chill it in your fridge and the fat will solidify on top. Then simply scoop the fat out. *The amount of stock you get from this recipe will vary mostly due to the size of your pot. What’s the difference between stock and broth? Can this be used for recipes that call for chicken broth? I love homemade chicken stock but have never made homemade turkey stock. That picture looks great and I will have to try to make it this year. This recipe came just in time. Thanks!! It is such an easy way to stretch a little more yumminess out of your turkey. Happy Thanksgiving! You can buy Ball freezer safe glass jars (wide mouth best) at places like ACE or OSH — they work great. I didn’t know that Ball makes freezer safe jars. Thanks for the great tip! Love the look of the jars. THANK YOU, Kristen! Yesterday, I bought a bunch of turkey wings on a whim (my store doesn’t carry bones). I’ve been researching stock recipes, but haven’t found one from a source I trust yet. I trust you, and will be making your recipe this weekend!